Master your way through the hairdressing profession in this 5 reel 20 payline online slot game. Reveal the new hairdos to your customers before every spin, and with their customer place bets on the game board. Become head and shoulders above the rest with your free spins and multiplier bonuses. Bursting onto the online gaming scene, Leander Games are particularly skilled in designing innovative video slots, and pride themselves in their outstanding game portfolio, with options for both social and real money gaming. In fact, the company were presented with the award of “Social Gaming Supplier of the Year” at the eGR B2B Awards in 2013, and have recently been nominated for numerous other prestigious awards – a real testament to the quality and breadth of their portfolio. Mad Piñata is a classic that can be enjoyed for its innovation and uniqueness in a market that is ever changing. Although it is not immediately clear what Jean Wealth’s theme is when you read just the title, this simplistic, colourful game clearly appeals to the beautician within all of us. 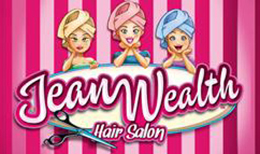 Set in a hair salon, we see bright pink colouring and styling throughout the online slot game. Combining this art style with cartoon objects such as hairdryers, scissors and combs, as well as classic online slot symbols, Jean Wealth has a sound track that matches its aesthetic… That is to say that you should mute the sound to enjoy the game, and even then you might need to turn the brightness down on your device to enjoy it! With a minimum bet of 0.01 across its twenty pay lines, this five by three online slot game leans more in the favour of the low roller. The symbols present on the reels do, however, are easily identified, and it is not unusual to get a number of wins right off the bat. The Wild symbol, highlighted boldly across the square with no other art attached to it, can be substituted for all other symbols on the board, except for scatter and bonus symbols – this is usually the case on all slot games. Depending on how many scatter symbols appear on the reels at once, you are given extra multipliers to your winning spin. If there are three, four, or five symbols on the board, you are awarded with a three times, twenty times, or a one hundred times multiplier respectively. One of the best features of Jean Wealth is, however, its bonus rounds, triggered by the ‘Bonus’ symbols on reels three, four, and five. If you pick the right hairstyle for the three women – you have a choice of 8 to pick from total – you are given free spins from three times up to twelve times. These stack, however, meaning you can get a maximum of THIRTY SIX free spins! This huge number of free spins is nothing to sniff at, as both the Wild and Scatter symbols can really up your multiplier bonus to win huge amounts. Jean Wealth, for its (too bright!) art style, can provide a lot of winnings, in the form of free spins and bonus rounds. Its interactivity of picking the hairstyles of the customers isn’t exactly unique, but this online slot game functions well in the selection of games that are available today.